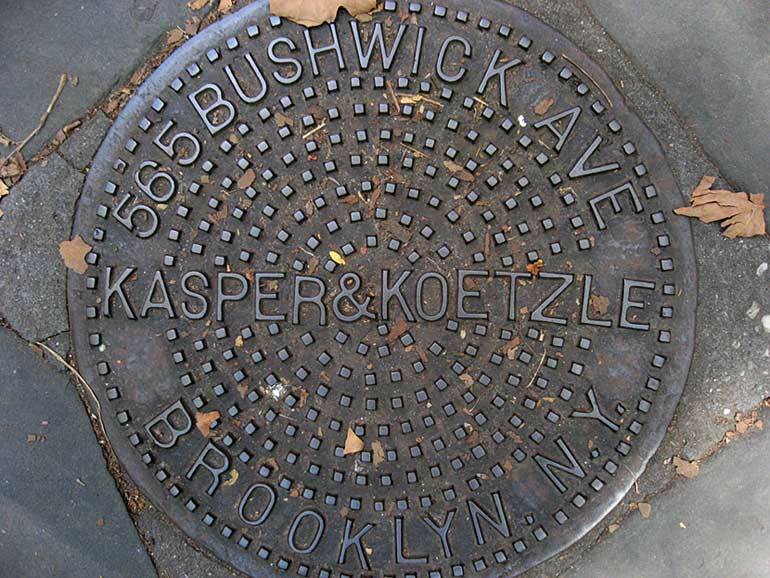 The Kasper & Koetzle Hardware Co. were located at 565 Bushwick Ave., Brooklyn, nearly 60 years (1905 until 1963/64). The business survived another 20 years (1964-1983) at 111-12 101st Avenue, Richmond Hill, Queens. The partners were William Kasper (1879-1976) and Frederick G. Koetzle (1873-1955). William Kasper was born 1 March 1879 in New York City and died 97 years later, 11 March 1976, in Jericho, Nassau County, N. Y. He appears in the 1900 U. S. Census living at 92 Stanhope St., Brooklyn, with his widowed mother, Agathe Kasper, age 58, an immigrant from the Netherlands in 1870. Agathe Kasper was the mother of 15 children, 7 of whom were living in 1900. Frederick G. Koetzle was born 10 April 1873 and died at the tender age of 82, 19 October 1955, in Brooklyn, N. Y. His obituary in the New York Times, 22 October 1955, read, "Frederick G. Koetzle, president of Kasper & Koetzle, Inc., hardware and steel merchants of 565 Bushwick Avenue, Brooklyn, died Wednesday at his home, 9 Schenck Court, Brooklyn. His age was 82. Mr. Koetzle was the oldest member of the American Steel Warehouse Association. He leaves his wife, Mrs. Louise F. Koetzle, and two grandsons." Frederick Koetzle's son, Walter Frederick Koetzle (1908-1992), a later president of Kasper & Koetzle, died 30 March 1992 (New York Times, 30 March 1992). Another Kasper & Koetzle coal chute cover is found on Perry St. in the West Village. Hardware Dealers' Magazine, vol. XLV, no. 3, March 1916, had this to say about Kasper & Koetzle, "Kasper & Koetzle, Nos. 565-567-569 Bushwick avenue, Brooklyn, New York: Mr. Kasper of this concern has been a frequent visitor at the National Hardware Exchange, and declared that they are having a busy time of it following up the advances in hardware. For the past two months they have kept one man at work reviewing their stock and prices, and revising all selling prices to correspond to present costs. Kasper & Koetzle make a special business of factory supplies and heavy hardware. Starting in business twelve years ago, their trade and stock have steadily increased. They now occupy three floors of a building fifty feet wide and two hundred feet deep, well filled with stock, adjusted to their customers' demands. A force of thirty are kept busy in the store, and five outside salesmen are continually after the business of the local trade. They have the goods from which to fill orders promptly; are alive to the business conditions of the day, and are successfully holding and increasing their customers against all kinds of outside competition." The Sellers' Guide Section of Engineering Directory, 1921, listed them as follows, "Kasper & Koetzle Hardware Co., 563-567 Bushwick ave. Pres., Wm. Dettmer; Sec'y, John L. Werney; Treas., Wm. Kasper. Est. 1906. Inc., 1918. Mill and factory supplies, power transmission equipment and hardware. Buyer, Wm. Dettmer."